Welcome! Thanks for stopping by and checking things out. I'm happy to share my creations and other adventures in life here with you on my page. ...nor does a family who lucked out with a phenomenal teacher. My son's teacher will be leaving us after this week since she is due with a baby very soon. Usually my son doesn't ask me to make much for him, so when he asked if I could make something for her new baby, I knew it was a given that she would be getting a lovey. I decided to go with an elephant because of the whole "never forgets" trait and phrase. She's been so wonderful and supportive of my guy, and encourages his creativity and intelligence. He's become very fond of her and I know he will miss her once she is on maternity leave. I too grew fond of her through our early interactions this year, and as time went on, even more so. I found myself reminded of the time I spent in my last few months of teaching as she is due to deliver in the same month as I delivered my son. I recall how it felt saying goodbye to students before the holidays, and because of that, I wanted to be sure she got something to remember us while she enjoys life away from school with her new baby. Here is the sweet little elephant lovey I designed for her. I went with a soft gray and a pretty multi tone mix of purples. An oversize bow plays up the girly element, and the ears got an extra touch of purple edging. 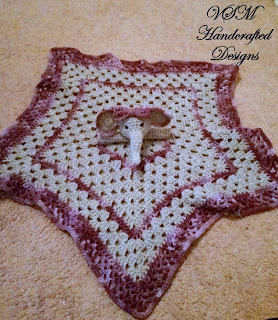 I also went for a fun pentagon shape to give it a different flare and made it so it could be draped across baby as a little lapghan. Overall, both my son and I are pleased with how she came out and are excited to give her to his teacher. His teacher will always be one we will remember, that is for sure. 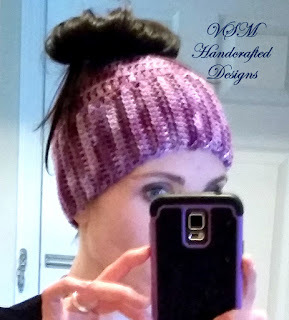 I have a new listing up on my Etsy shop and it's for a bun hat pattern, yes, you read that correctly, bun hat. If you want it, click here and it will bring you right to the listing. What is this hat you ask? Well, I had asked the same and then a pair of friends showed me a picture of one. Then they wanted to know if I could make up one for each of them. After taking a look, I knew that would be totally possible. So, I went ahead and made up a couple for them, and then shared the pic of one that I took of myself wearing one, and suddenly other people wanted one! They are a cute concept and definitely long hair friendly. Half the time I have to put my hair up in bun anyways after I wore a hat because of "hat hair" as it is! These make it easier and are cute as can be! I am also selling this now as well, so if you want one made up for you, please click here to go to my Facebook page and send me a message. I'll be more than happy to help you out and make a fun bun hat for you, or whomever you'd like! Is he there at the North Pole all year? How does he know where to go? Honestly, I do believe in Santa. Ok, I know he isn't a physical presence up at the ole North Pole, but I believe there is the concept of a kind person with a big heart who wants nothing more than to make children and their families smile. This person takes on many forms and can be in many places all at the same time. This person will be the first to willingly pay it forward without anticipating anything in return. This person will let another go ahead of them in line, or return a wallet safely and undisturbed to its rightful owner. 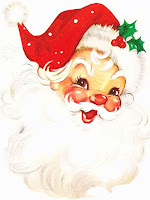 Yes, the spend, spend, spend, buy, buy, buy, go above and beyond commercialism of it all does blur the concept of Santa's role in the holiday season, but there is no reason why the concept of Santa can't be shifted and simplified to fit the needs of what you want for your child. It doesn't have to be Elf on the Shelf if you don't want it. It doesn't need to be a pile of presents under the tree. I know that not everyone is a full supporter of his presence in the realm of children, but I for one appreciate the concept of a person who wants nothing more than to make a child happy and feel special, or surprise a neighbor with a plate of homemade cookies, or put forth the effort to change a perfect stranger's day into something better with a random act of kindness. I'm not dreading that question when it comes, which who knows, could come up this year. I feel ready to share the secret of how Santa works if my son wants to know. Kindness, compassion, generosity, joy, all attributes bestowed upon a large jolly fellow, have the potential to transform any person into a living, breathing...Santa. I believe that the moment any person takes the time to put in that little bit of extra effort for someone else, they become Santa in a way. 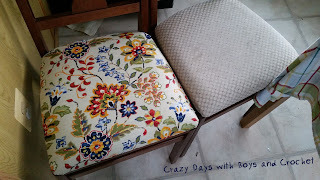 We have a set of kitchen chairs that certainly have seen much, much, much better days. After two boys and lots of parties, these chairs are now a bit worse for wear and well stained. The thing is, they are still in good working condition outside of their well used look. Believe it or not, all it took for this fresh new look is a $10 table cloth. Reupholstering sounds like a scary task, but for a simple project like this, you really only need to know how to do a few steps for quick results. Quite honestly, I am not going to reinvent the wheel here. For a go-to DIY, check out this Wiki article. It has pictures and written directions that cover every thing your are going to need to do. 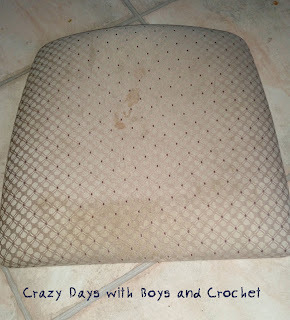 The only step I don't bother with is removing the old fabric. This is for two reasons. First, it means that it will still be there just in case the new fabric needs to be removed. Secondly, the padding won't shift around on you, making it much easier for those who are first going about changing out fabric on a seat. Let me tell you, it is totally worth doing if you are on a budget but need/want a new look for your dinning zone. I went with a durable table cloth rather than buying fabric. It's often so much cheaper than buying fabric from a bolt and the fabric I find is thicker and holds up more because it's made to be exposed to stains and food. As you can see in this pic, stains happen, and even after treating, they have a bad habit of coming back after a while with some new friends. I also wanted to go brighter and more cheerful that the original pattern. That's the great part...you can do this as often as you'd like and change out your other decor! 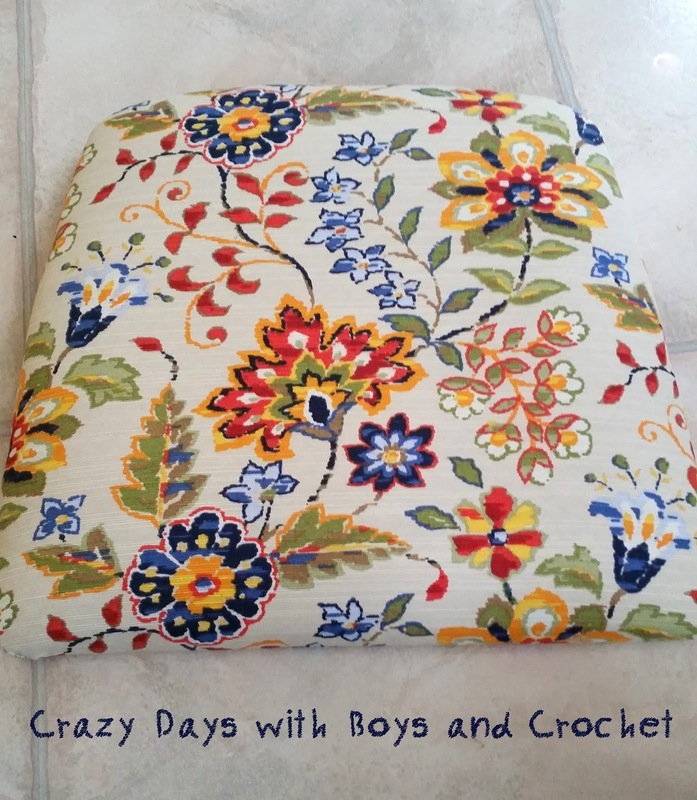 So grab your scissors, pliers, staple gun, lots of staples for the staple gun, a screw driver, and your fabric of choice to get going. 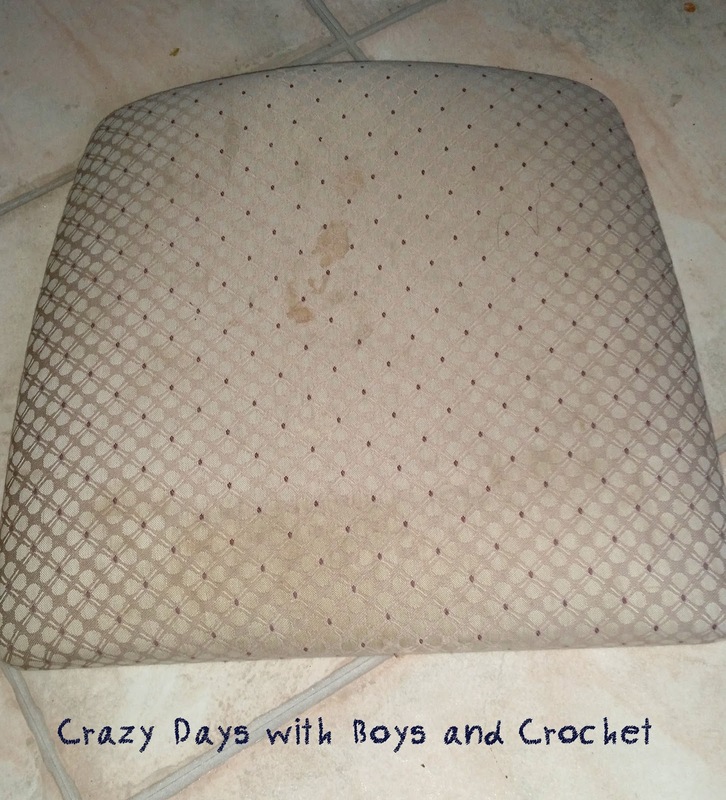 Follow the directions...and then you go from gross old seat, to fun and playful seat! Side by side. What a difference!!!! I always appreciate orders that come in and aren't the usual requests for a scarf, or afghan, or the like. Being able to be a bit more outside-of-the-box creative is a refreshing change of pace and helps keep me on my toes. When asked to take a look at an old sweater, at first I figured it would be a repair job. Instead, it turned into something far more interesting and perhaps one of my more favorite orders as of late. A friend received a beautiful shawl collar sweater from her mother, who received it from my friend's grandmother. It was a beautiful knit piece made to look like patchwork squares in those wonderful earthy colors of orange, tans, and blues. The sweater was easily over 50 years old, and well loved and worn. A hole had made its way into the under arm of one of the sleeves and would have been a very simple fix. She sent me a few pictures to see what everything looked like. But, it wasn't to be a stitch and send back in a few days project. 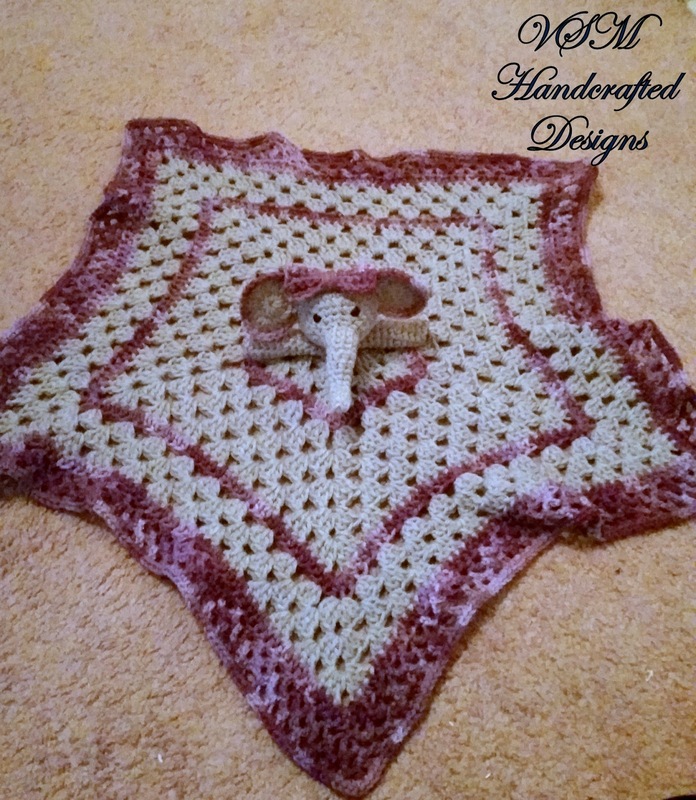 She was expecting a new baby, and wanted to turn it into a blanket for the baby if possible. We figured it would be best for her to ship the sweater to me so that I could get a better look at it and determine if a blanket was a possible outcome. When it arrived at my house, you could tell this sweater had meaning to more than just one person. The knit was soft and still carried a hint of someone's perfume, or maybe many perfumes combined. The colors were a bit faded from age, but their beauty still present. And, while it was a more tunic-like in length, it didn't exactly present itself to me as a possible transformation into a full on afghan. No, this sweater needed to be more than that. The back panel of the sweater would be large enough for a sweet lovey, but then that left the sleeves and front panels unused. The more I looked at the colors and the square patches, the more I began to think of those lovely, traditional teddy bears. The well worn and loved childhood toys that weren't made of faux fur, but of material scraps a family member may have used to create a simple gift for a new baby, kept working their way into my mind. The sweater needed to also become a bear. 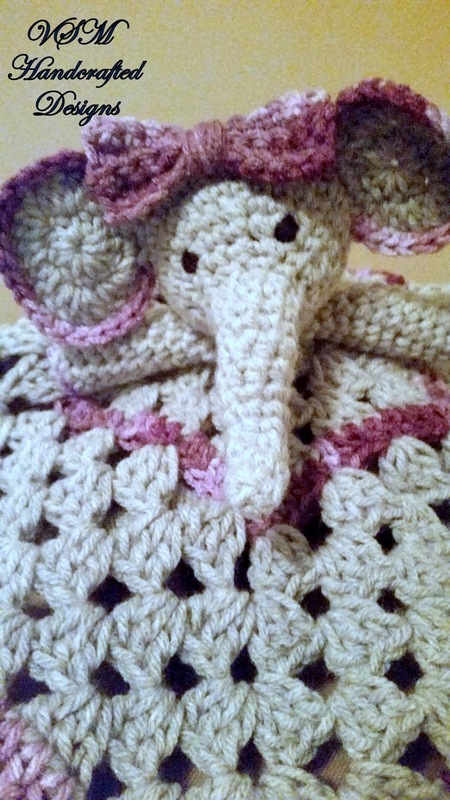 I knew in my gut that it would become an adorable, soft, and comforting friend for baby, just as it was a comforting and warm sweater for baby's mommy, and great grandmother. I ran the idea by my friend to see if she was open to it. Luckily she was trusting enough and a teddy bear and lovey it would be. When I got the go ahead for the bear, I sketched out the pattern for it on parchment paper and began to place the pieces where needed. I wanted to be sure each square of color got worked into the form. The blues were featured slightly more since it was for a baby boy, and I kept the bits of cream to a minimum to make it a little easier on mom in case stains found their way to this new friend. As always, the face was hand embroidered so that it would be safe in baby's hands, and mouth. The legs can be moved around, thanks to a classic buttons and yarn technique used on the inside of the bear's torso and legs, so that buttons or the like of newer adjustable limbs will not be accessible to baby in any way. When put together, the pieces were stitched in two different ways to ensure all would hold together nicely and keep the form of the bear. I didn't over stuff the form either. I didn't want it to be so stiff that it felt hard. Instead it's a little more mushy and squish-able for little hands an arms to hold it close. To finish off his look, Mr. Teddy Bear, as I began to call him, got a dashing scarf in a mottled gray that plays off the cool tones of the darker blue. That was also sewn closed to keep it nicely around the bear's neck. When he was completed, I knew this is what was meant to be made. He turned out even better than I had hoped! Now that the bear had his moment in the spotlight, I moved onto the lovey. 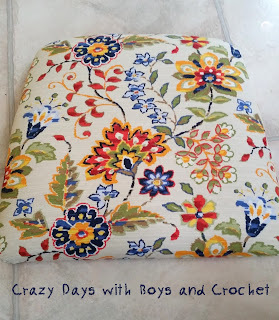 When getting the supplies pulled together for it, I figured the super soft minky fabric as the back fabric would be a great companion fabric for the vintage knit. After looking at a few color options I selected an ivory tone because it mimicked the aged creams in the sweater. 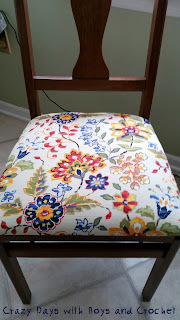 Originally, I intended to then edge the whole thing with a classic satin edging in a complimenting blue. That soon changed when the supplies came to my house. I placed the minky fabric against the knit and it was a great complement to the knit, but that satin edging was all sorts of wrong. I did try to work the edging on, but all it did to the piece was make it lose any of the rich qualities it originally had. The satin was just too new and suddenly made the knit look dull and old, instead of warm and well loved. Well, now what? It isn't a new thing to have an original plan get tossed, but I couldn't leave the lovey with raw edges. Down to my basement and my yarn supplies I tromped with some scraps of the fabric in hand. A couple years back I came upon an estate sale of two very large boxes of yarn dating back as far as the late 1960's. I pulled all the colors I had from that vintage stash and held them against the sweater knit. Suddenly, an orange I kept putting to the side instead of using for other projects magically made itself known as the perfect mate. It was the closest thing to a perfect match of the darker, rusty orange that ran through the sweater. Immediately I knew the lovey needed to be edged in this color. Chances are the yarn and the knit were made about the same time as well. 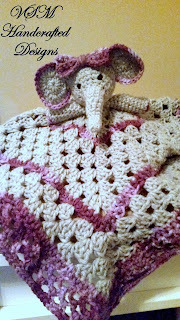 Using a simple Tunisian stitch, I began to make the edging for the lovey. 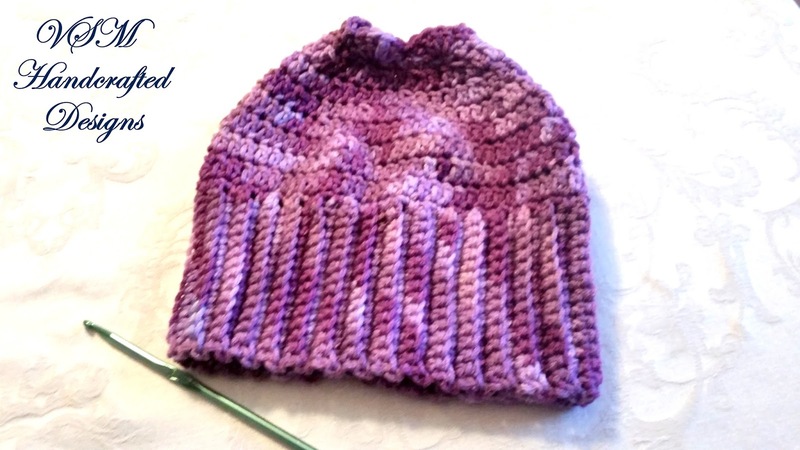 I purposely flipped it to the "wrong side" because it created a ribbed look like that in the original knit. The whole lovey is hand stitched together to help preserve the knit. I didn't want to risk my sewing machine getting troublesome and snagging the more delicate fabric of the beloved sweater. Once all the pieces came together, I knew that was the right way to go. That blue satin edging can easily be worked onto something else. This orange yarn needed to be used for this project. No question about it. And now these two pieces are done and ready to be shipped back to their new owner. I can only imagine what it will be like for the little guy to learn that one day his buddy and lovey are made of something that was, and still is, a cherished heirloom. I loved the many layers of this project. The use of an old bit of clothing, that while loved, wasn't working as a sweater as much, and a skein of misfit yarn suddenly that found its purpose in the creative world, and finally an idea that morphed into two different creations instead of a simple blanket, all make this project so unique and special. In world where we too often just toss old aside, the bear and the lovey show how some things really can do better with a second chance and a lot of love. Anyone who needs to be dairy free knows how hard it can be to find those rich creamy treats without the fallout of hidden dairy. After looking at mix after mix of instant hot cocoa, I figured I would need to stick with my stove top, decadent hot cocoa with coconut milk recipe, which is still super satisfying and great, but also a little more work. It's also is a nice treat but not something to drink every single day if you are worried about the waistline. 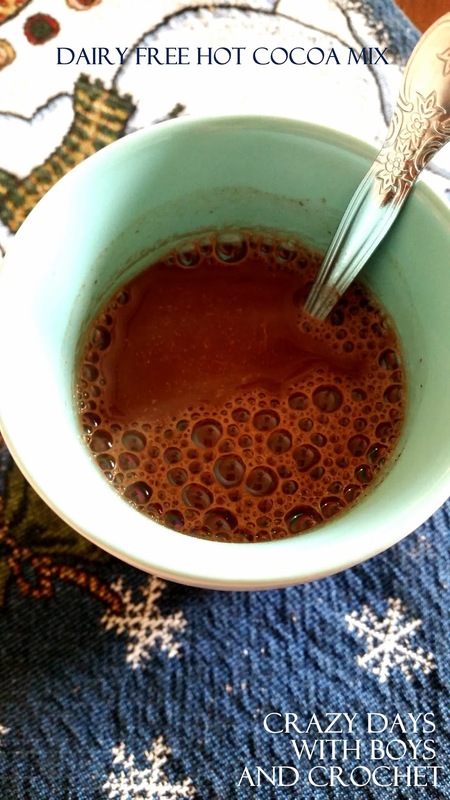 I also wanted something with a different type of kick than the usual cocoa blends. 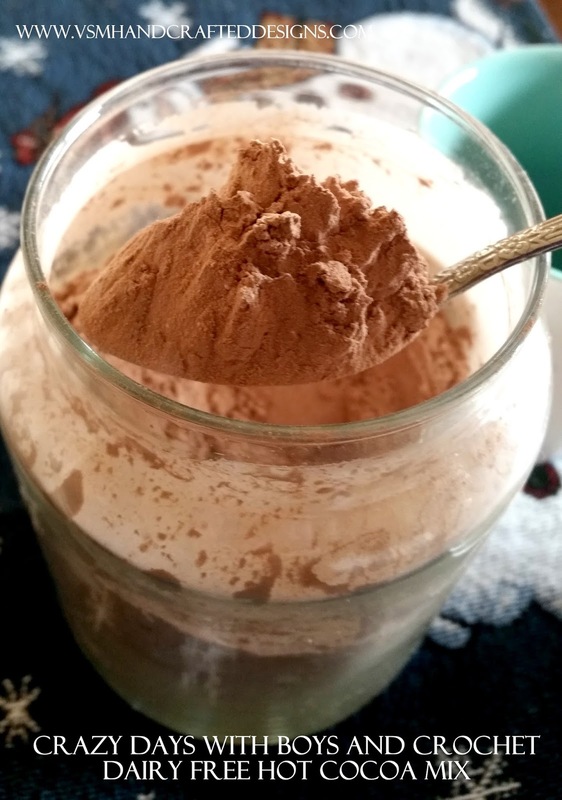 So, while figuring out how to make something a bit more instant, less fat count, and a bit different, I came up with this dairy free mix. The ingredients are probably already in your house, too! I will say though, the fresher your ingredients, the better this will taste. I mix up a batch in an air tight container and leave it on my counter for easy access. I love how quickly it comes together, yet still feels like an awesome treat. Plus, I know every single ingredient going into the mix. 2. Close container tightly and shake until all the ingredients are well blended. 3. Allow mixture to sit about a day ahead of time for everything to season together for best results. 1. 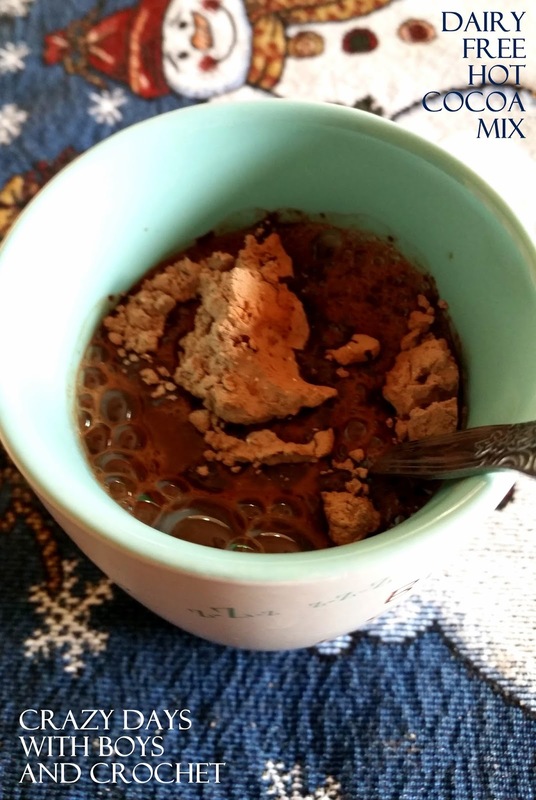 In a mug, add 2-3 heaping spoons of mix. 2. Add in hot water and mix until well blended. 3. Can be served with just the hot water, or you can add in a few dashes of your dairy substitute of choice. For toppings you can put marsmallows or coconut milk whipped cream on top, or stick a nice candy cane into the mug once it is all mixed. In a chilled glass bowl, add in a chilled can of Golden Star canned coconut milk but make sure to not add any liquid from the can, 1/4 cup powdered sugar, and 2 tsps vanilla extract. 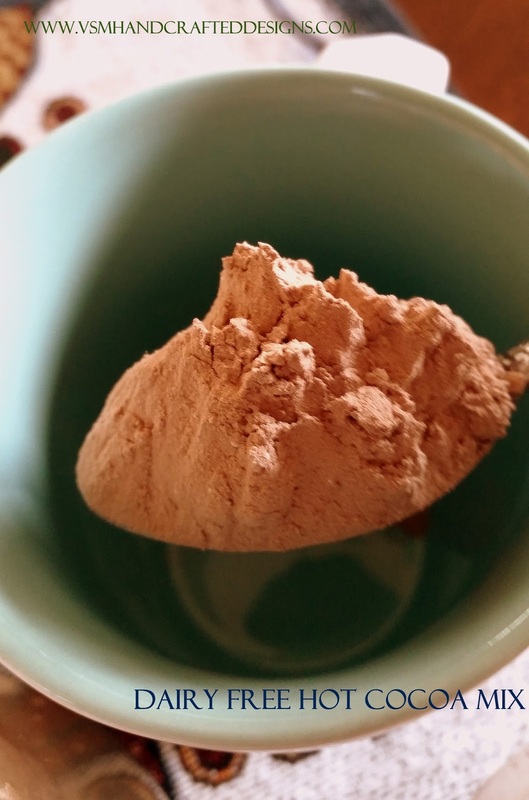 With a hand mixer, blend together at medium speed for about a minute. Then tilt bowl and continue to blend at a high speed to incorporate more air into the mix. If all is chilled properly and you give it time, you will have an awesome whipped cream that can keep in the refrigerator for about a week without needing any further whipping. Make sure to store in an airtight glass container for best storage. 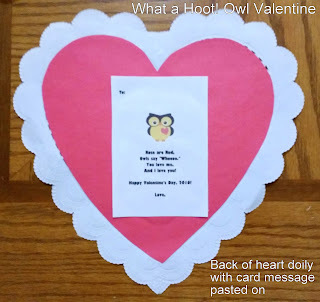 Thought it would be fun to do some more heart animals and the have the boys use them for their Valentine's Day cards for their teachers. I figured let them inspire what would come next from that point. While eating lunch, I asked them both what animals they wanted to try and make using mostly/only heart shapes. My youngest piped up with "cow," "black sheep" and "chicken." Those all sounded do-able. My eldest's first round was National Geographic worthy and I wasn't too sure I would be able to do much of anything with just hearts. He kindly compromised and altered it to a "meerkat," "little blue penguin" (no, it's a real deal animal not just a color), and a "rabbit." Far more able to work on those three concepts! You'll have to pardon the lighting on these pics. We needed to get these pulled together today since this week is crazy and these needed to get done before Thursday. I'll explain what and where I can but the pics should give you the idea. 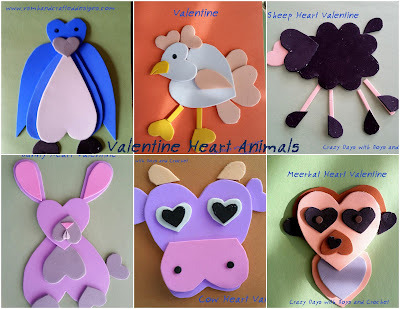 Also, I know there is a touch a macabre by saying the "animal heart" aspect, but rest assured, I'm talking heart shaped! Also, these are not a step by step how to. Instead I have a picture of all the hearts and shapes you'll need and then a picture of the final result. The description will include some needed steps that might not be so obvious at first glance. *All animals will need to be assembled onto a piece of paper. We decided to fold construction paper into a card and then assemble the animals onto that. 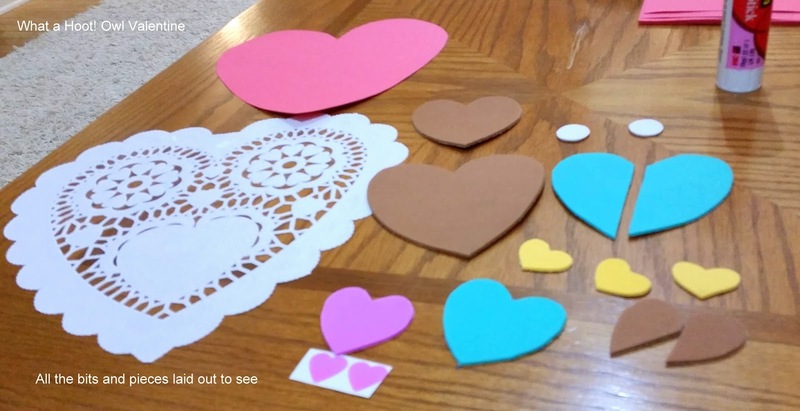 We also used the sticky foam paper for the heart shapes to make it a bit quicker and not have to worry about drying time. This was the most challenging to capture since the animal is so sleek and monochromatic. 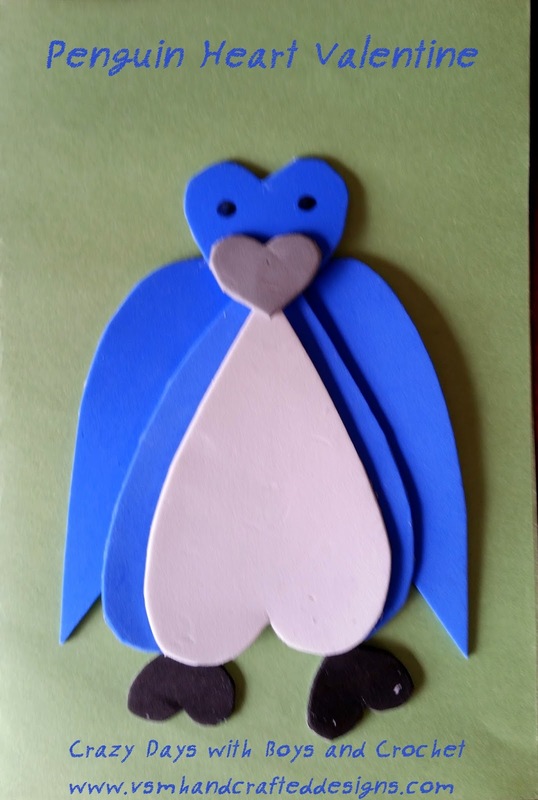 But a little image searching and lots of thinking outside the box helped us get this little fellow created. From the picture you can see I used a medium brown, gray, black, and peach for the meerkat colors. 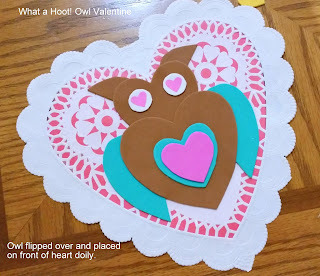 I would suggest printing out the heart forms from my What a Hoot! Owl Valentine post. 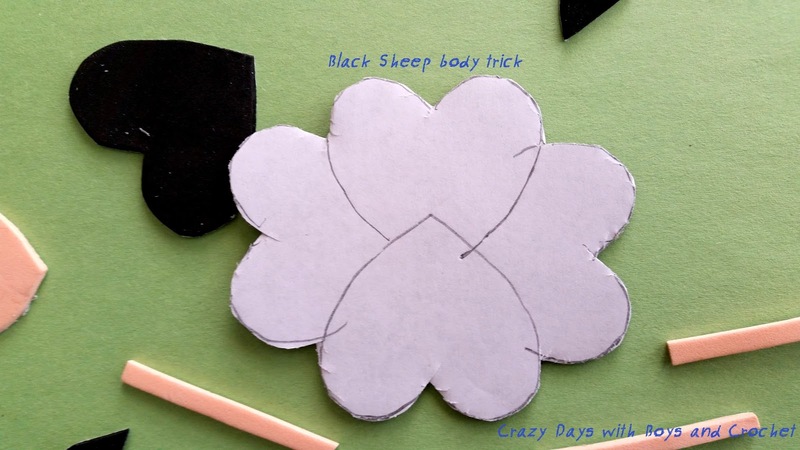 These will make life easier in general when making the animals, but you can always freehand it as well. 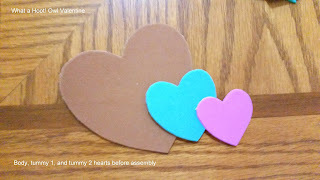 For the eyes you will need 2 small sized hearts in black and 2 medium brown hole punch size circles. The ears are one small heart cut in two. The chest is a medium heart in peach with a slightly smaller heart in gray. The head is a medium heart in peach with an extended heart top strip made out of the brown. Finally, you have a muzzle with a smaller heart made out of brown and a little heart made in black. Assemble together as shown in the picture and you have a meerkat! This was far easier to create than the meerkat to say the very least. Once again factor in the hearts and sizes as shown in the picture. My youngest wanted a purple cow, so a purple cow we made. You want a main color, a pink for the nose and lighter color of some sort for the horns, and of course the white and black for the eyes and nose accents. The purple also helped me see that this could easily become a hippo option, too. I would suggest getting rid of the horns and taking the small hearts cut lengthwise in white to act as those big teeth and place them in the mouth area. For the ears shift them up from the side and place where the horns are on the cow version. You want the largest heart from the templates to be the head. Then you will want the second largest one for the nose and bottom lip is a medium sized heart. The nose actually gets trimmed and you snip off the point of the heart. 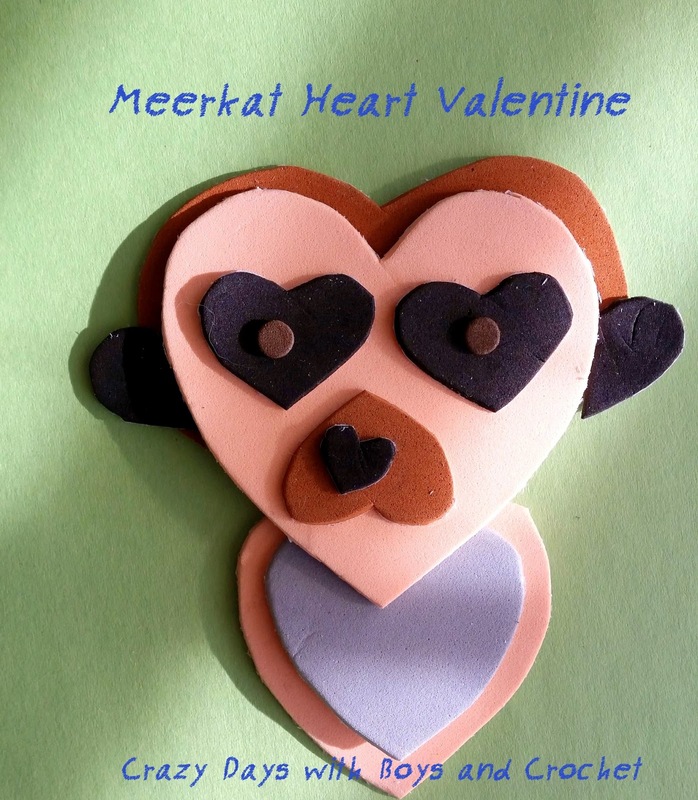 I decided to do the same trick with the top of the heart like in the meerkat for the bottom lip just to cut down on bulk with the sticky back foam paper we were using. If you are doing construction paper, no need to do that. Then it was two small hearts in white for the eyes, and two slightly smaller hearts in black for the pupils. The horns are made out of a small heart cut in half lengthwise and the ears are also the same size small heart. 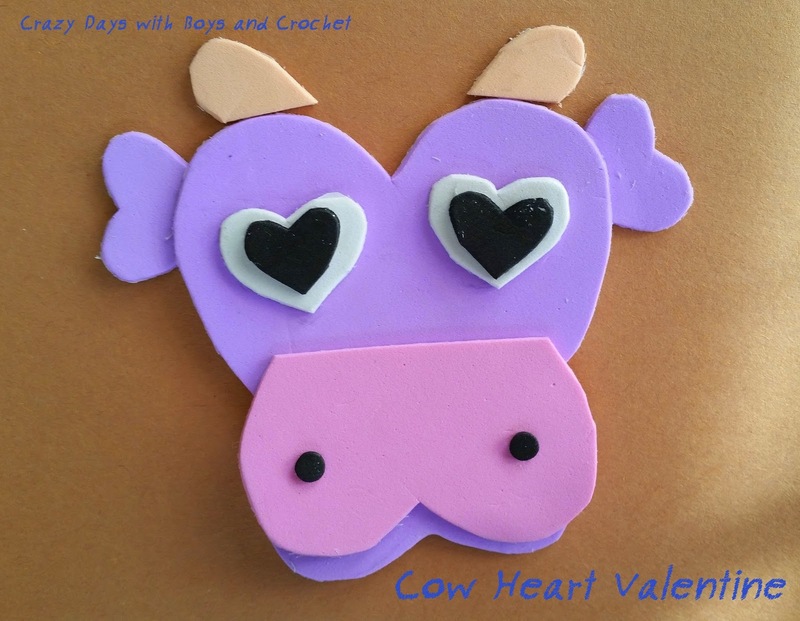 The nostrils are once again the hole punch bits placed on the upside down nose heart. 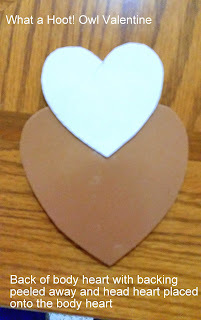 This one is easy, but you will want to freehand a very small heart out of white to make the buck teeth. I used the black marker to draw a line up the center from point to meeting of the curves. I also just drew in the eyes with a marker (not pictured) and nipped off a corner of a paper to make the little nose. You really only need three colors and a bit of white for your rabbit. (We did purple, gray and pink.) 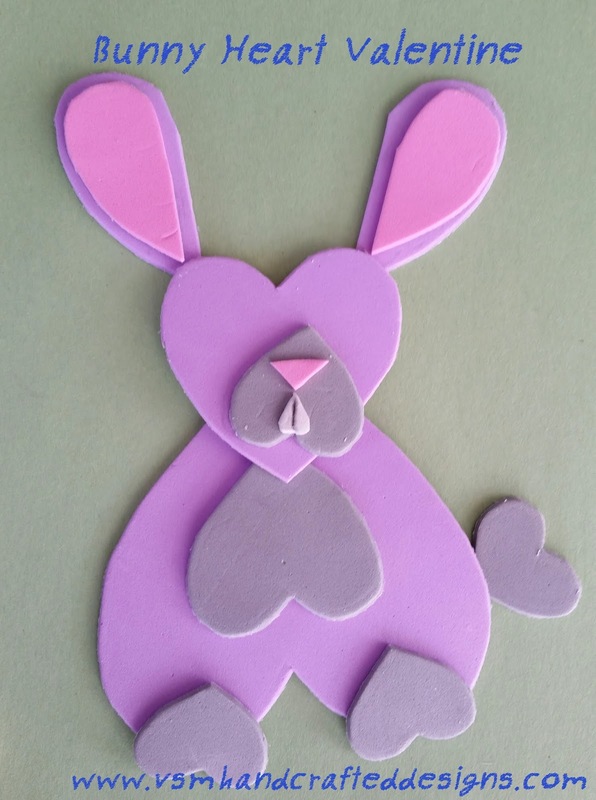 For the ears you want a medium heart in your choice of rabbit color with a slightly smaller medium heart in pink for the inside of the ears. The head is also the same medium as the outer ears. The muzzle is one of the smaller hearts, as are the paws and tail. The body of the rabbit is the largest heart with one of the medium hearts in an accent color to act as the chest fluff. For sanity's sake, it was so much easier first putting the layers of the ears together, then putting the nose and teeth onto the muzzle. Once we did that, we started to put the rest of the rabbit together. Otherwise, it got very complicated keeping in mind which areas to not press down on or glue before doing another part of the body. This proved a little more complicated than I thought, but it still was a fun one for my youngest to pull together. You want to pick out a main color for your hen. He wanted white. From that choice you'll want a color for the wing, tail feathers, and accent head feathers. He went with peach. You also will need yellow for the beak, legs, and feet. The body is a medium heart with the head a slightly smaller size. 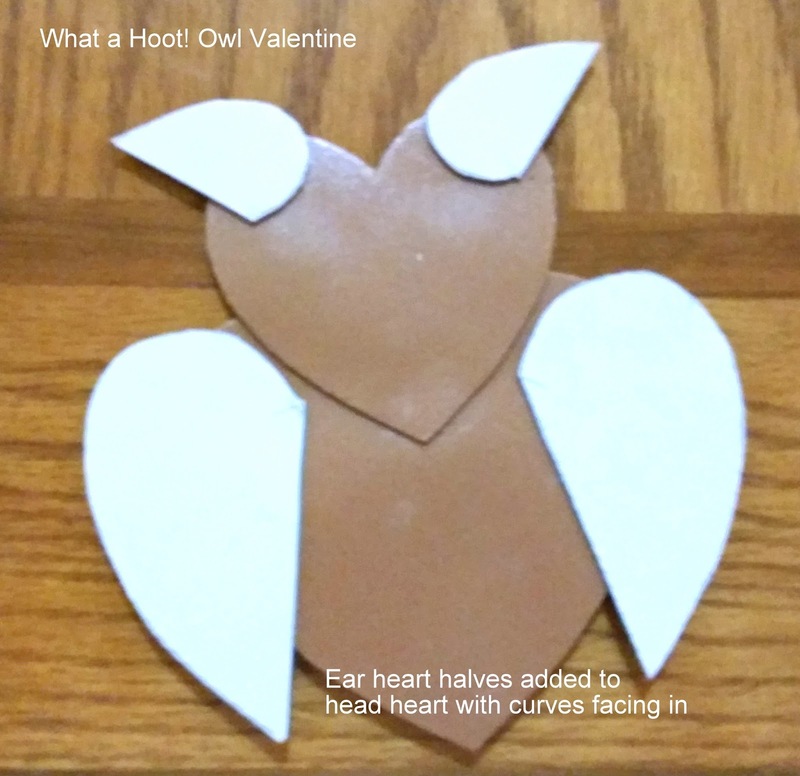 The tail feathers and wing are also the same size heart as the head. Then the head feathers and the feet are both the smallest size heart. The beak is also the smallest heart but you only need half a heart to make it. I nipped a little slit at the point to create the upper and bottom beak look, but you can easily just use the marker to create the same idea. The legs are just long thin rectangles I cut by hand. You do not need to be exact with them since they may need some trimming depending on where your kiddo decides to place them. Yes, this can also be a poodle. My older son and I realized this after it was assembled in black. The inside of the card has a funny little line about counting sheep so I figured that should help get the idea across. Probably what needed to happen was placing the head up and out a little more and making the legs black as well, then switching the size of the hearts. 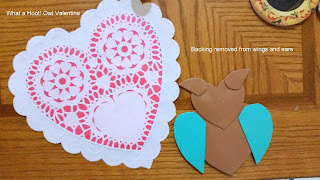 A slightly larger heart in peach and the the other half of the small black heart from the tail would've helped the overall look... The youngest was thrilled so really that's all that mattered at the moment. 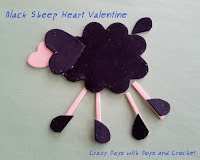 The body of the sheep is actually four of the medium hearts worked around each other. Make sure to check out the photo detail to the left to see how that came about in form. You will then also want 2 small hearts in black for the hooves, cut them in half lengthwise. 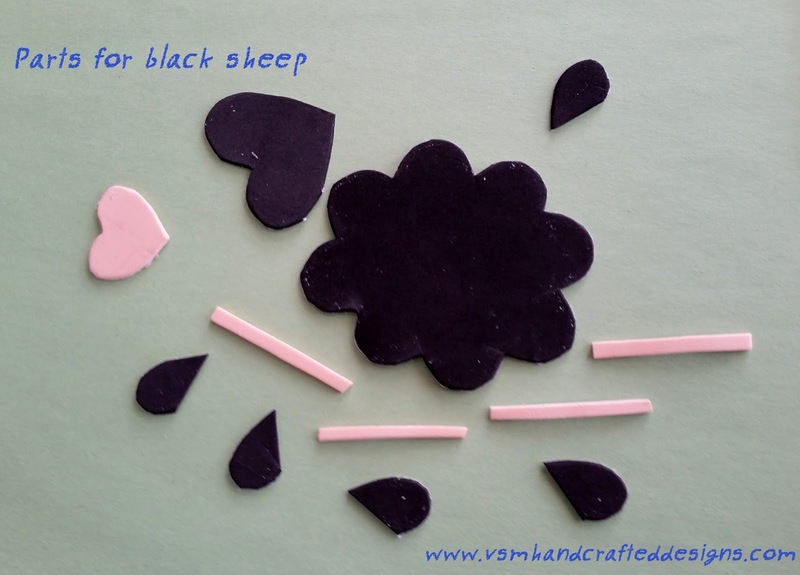 The face is made up of a small heart in a peach color and then a slightly lager heart in black (keep if this way if you want the poodle look). The tail is half of a small heart in black. The legs, again, are the freehand narrow rectangles that you can trim as needed. After it was all assembled I used the marker to put an eye onto the face. Both the boys are learning about penguins so when the oldest mentioned this specific penguin and we asked if it was real, we figured it had to be, what with the way they both began rattling off details. The best part is they go to different schools! This guy is pretty simple but I did end up freehanding a more elongated and narrow heart for the body and wings. 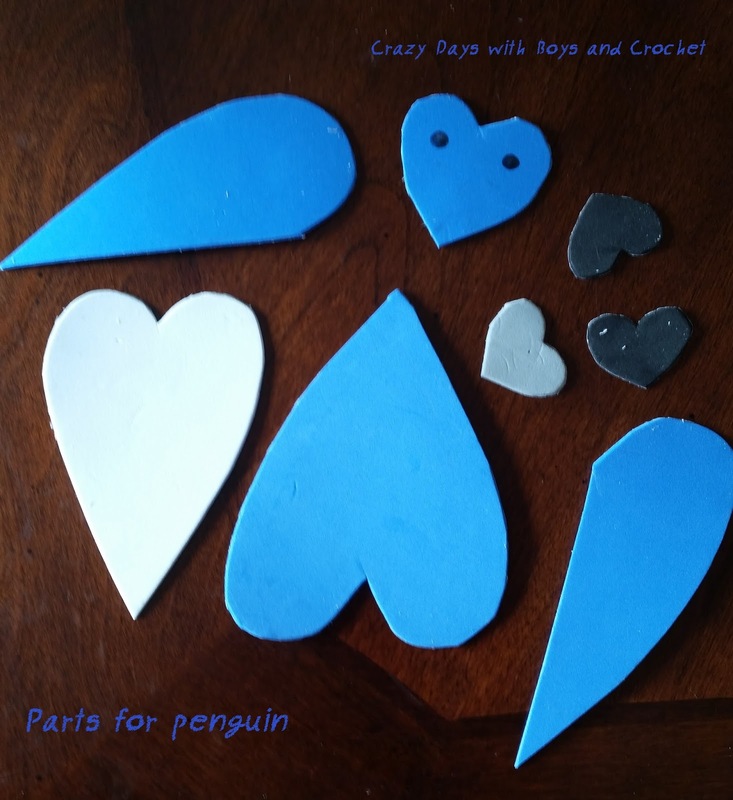 The rounded out hearts from the templates were too baby penguin looking, but if you like that, then go ahead and use them! The head is the largest of the small hearts from the templates and the beak is the small heart, as are the two feet. You do want blue for the wings, head, and body, and then white for the belly. The beak is a gray color and the feet a sharp black. To keep it easier, I also used the marker for the eyes again since the hold punch size was just too big. Again this isn't a step by step for each one simply because of how extensive that would be. With the use of the templates and a read through of the owl post, though, you should be able to pick up on what to do. Good luck and have fun! 5 Easy Life Hacks that Actually Work! Let's face it, with motherhood and life in general, sometimes its those little life hacks that come in handy. I know there are a bunch floating around out there. I've tried many myself. Some work, others....well I'll be nice and say back to the drawing board for those. This post shares the top 5 Life Hacks that I've found actually work and are pretty darn helpful! 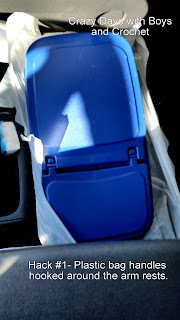 Hack #2 Dollar Store Shower Caddy Turned Snack/Meal Server- When do I like using this one? Well, on those road trips of course!! This little trick is the other reason why lost bits of food is drastically reduced in my van. Now, keep in mind, these caddies come in different sizes. I went with a smaller version for the time being because it is easier for little hands and laps to hold onto them without getting to be too much for them. The larger ones will probably come in handy as they boys get older and start eating even more. All you have to do is load up the caddy with the meal or snacks and pass it along to your child. They can take it from there! Leaky juice box? 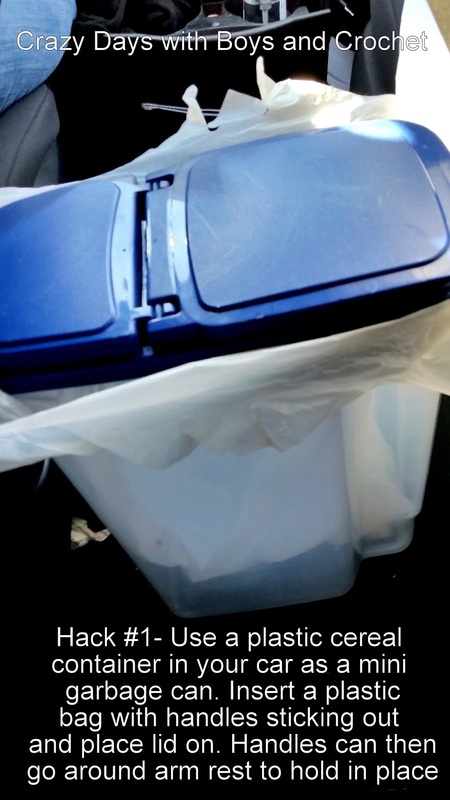 The caddy will catch it since there are no holes in the bottom. Nuggets still to hot? That's fine. Their little hands hold onto the caddy, not the hot food. A quick hand washing and they'll be ready for the next use. I purposely keep them in my van for any impromptu stops, too. 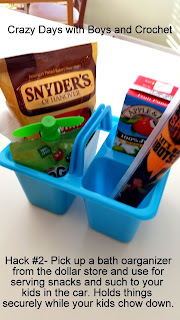 Hack #3 Shoe Organizer Turned Snack and Pantry Items Holder- I'll be perfectly frank here. I actually have three of these in my house being used for items other than shoes. The pantry incarnation is the most recent and the most liked by the kids because it means easier access to their favorite snacks. I purposely fill it on the vertical so that my younger guy can still reach the various items. The great thing is that this frees up so much space in your actual pantry for larger items like cereal and large bags of chips. 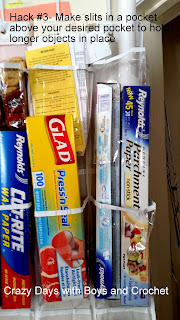 For the way high up sections that they can't reach at the moment, I rigged them for my plastic wrap, foil, parchment paper, and various takeout menus. If you notice, the parchment paper boxes are a bit longer than the other items. To keep them from flopping out, I cut the bottom of the pocket just above the pocket in which the boxes are placed. By doing so, you still have the upper pocket material to use as a strap instead of a pocket. I'm so pleased with how well this works. As for my other two, I have one in my linen closet for cleaners, toothpaste boxes, mouth rinse bottles, soaps, etc. The laundry room one holds our reusable water bottles, dusting pads, and the other various odds n ends you'll find in your laundry room, especially of the smaller variety. 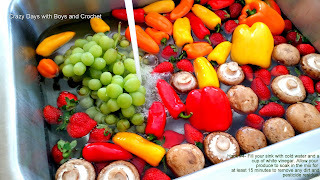 Hack #4 Soaking Your Produce in Vinegar and Water- Yes, I know you can buy products that get your produce items squeaky clean, but, have you read those labels? Why do I like this hack? Because it's simple, it's food safe, it's cost effective, and it works. I make sure my sink is cleaned out (see Hack#5 for that cleaning tip) and then begin to fill the sink with cold water. While it fills I add in food grade white vinegar. Usually 1 cup will do the trick but a 1 part vinegar to 5 parts water works if you want to size this hack down to a bowl. I then add in all my produce and swish it around every so often while it soaks. Make sure to soak for a about 15 minutes. Then, I removed the produce and rinse it under cold water and then place on clean tea towels to dry. If you have a double sink, this is an easy way of doing it. 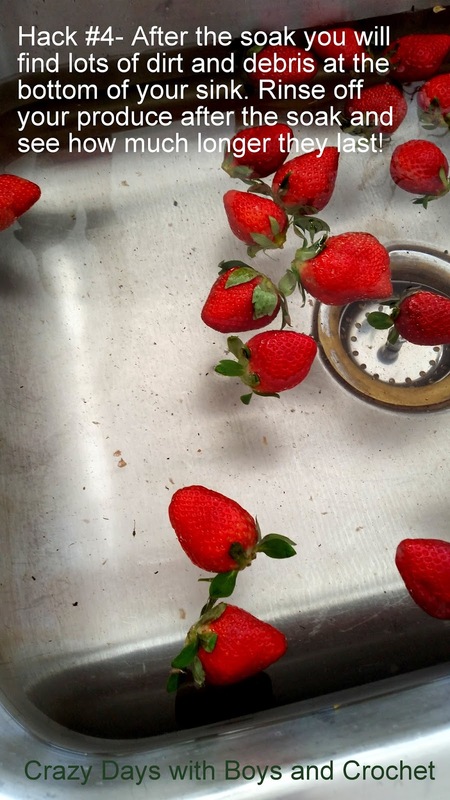 If you don't you'll want to remove the fruit before you drain the sink, and then rinse the fruit once all the water and debris is down the drain. I also find this trick keeps my produce longer, especially my peppers and strawberries! 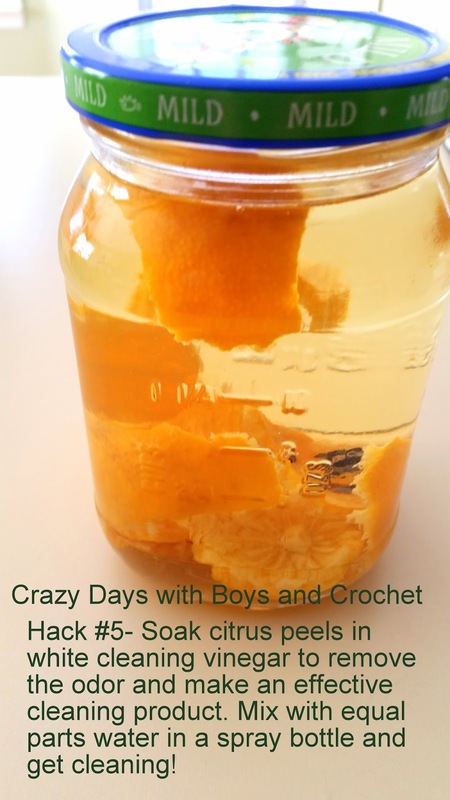 Hack #5 Citrus Peels in Cleaning Vinegar- I like knowing what I am using to clean. This means that I use my steam cleaner more often and love my baking soda for a good scrub down on my sinks and tubs. It also means I am a huge cleaning vinegar advocate. It really gets things fresh and clean without dealing with dangerous fumes like bleach. I actually have to avoid bleach because it triggers my migraines and asthma. (Fun combination that one, can't breathe with a raging headache.) Oh, but some people are gun shy because they don't want their homes smelling like a salad. I get that, I really do. So, here's a great way to get the power of vinegar AND citrus oils with little effort on your part. In a large jar put as many citrus peels as you have on hand. I've used anything from oranges, clementines, limes, and lemons and all do a great job of masking that vinegar smell. Once you put the peels in, fill your jar the rest of the way with cleaning vinegar. Cap the lid tightly and give it a shake. You'll want this solution to marry for about 2 weeks. I leave the jar on my counter near the sink so I can shake it every other day while things marinate. After two weeks, take out a fine strainer, a large measuring cup with spout, and a funnel. Put the funnel into your spray bottle and then in the large measuring cup, put your strainer on top while you slowly pour out your vinegar mix. The strainer will catch any rogue bits of peel and pith from the citrus. Then take your measuring cup and carefully pour your vinegar mix into your spray bottle. Fill it halfway and then add in water. Give it a swirl or a shake and your mix is ready to use! I use this daily for various needs around the kitchen and home. The citrus soak gives it a fresher scent than just as a straight vinegar mix. I store any remaining concentrate in a glass jar under my kitchen sink. So there you go! These are my tried and true and will not go without life hacks in my house. I do have some others, but those are for later on. Give these a try and see how well they work out for you! 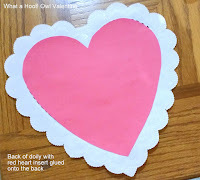 I signed up to "host" the Valentine's Day party for my youngest son's class. 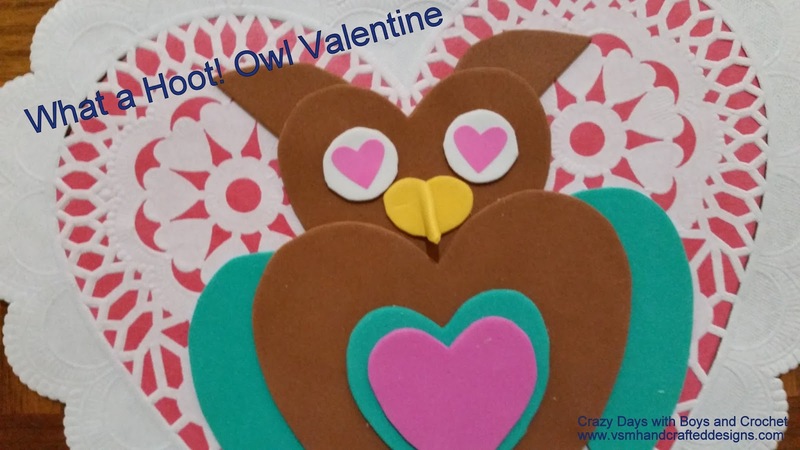 Now I knew this would mean that I needed to get a fun and easy craft pulled together for this. I also had some fall back ideas from things I've done in the past, but I really wanted to try and bring in something fun and new for everyone. Off to Pinterest I went and found a really cute pin of animals made up from different sized heart. A fish, a puppy, a lady bugs...oh such great options! Of course the mind begins to come up with ideas just from that. You have to see what is there by going here to see the adorable animals from housingaforest.com. Oh but wait...14 4-5 year olds and lots of animals to choose from really wouldn't be the greatest combination. First of all, trying to prep to make sure I had enough hearts for all variations would land me in the funny farm. Secondly, you know that a few will suddenly want to do a different animal once they see a friend making one they didn't select. Ok...regroup...the owl. 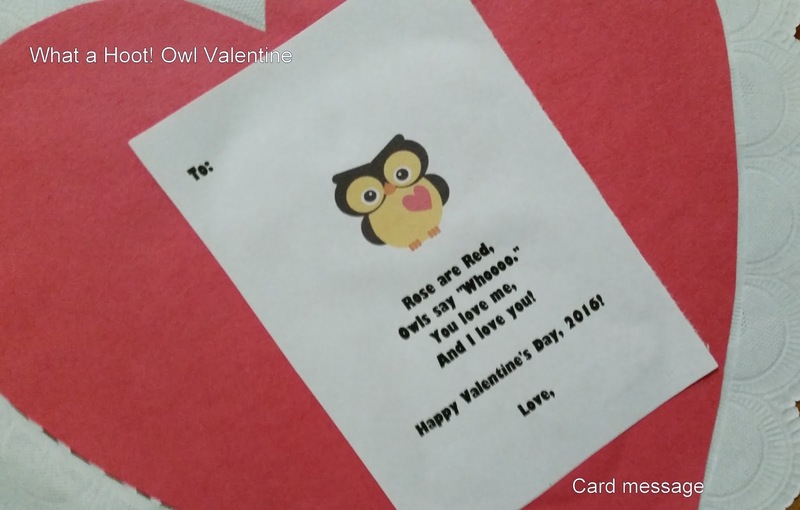 For some reason, these kiddos really like owls this year. Perfect! There was an owl option. Taking a look at the photo gave me an idea of where to start. I wanted to turn this into a cute valentine for the kids to give to their parents. 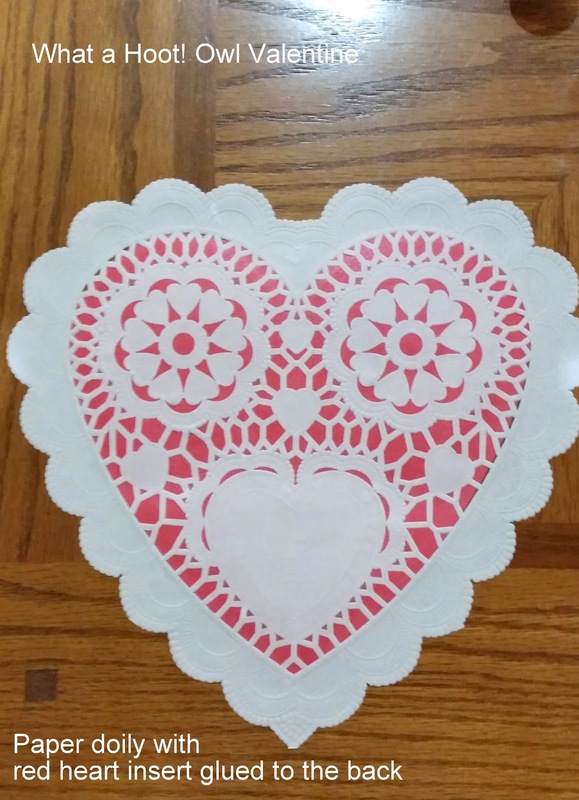 So, the doily concept came about along with a cute little phrase to add to the back to function as the message of the card. I came up with the phrase myself with the help of the other mom working with me. The cute little owl on the message is a nice clip art pic absolutely perfect for this project. Very easy to recreate, I promise. But if you want to get a downloadable version, use the contact me feature on the page and let me know. I'll happily share the file with you! 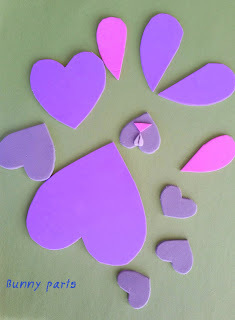 There was also the other issue of making sure the hearts all worked out size and symmetry wise. 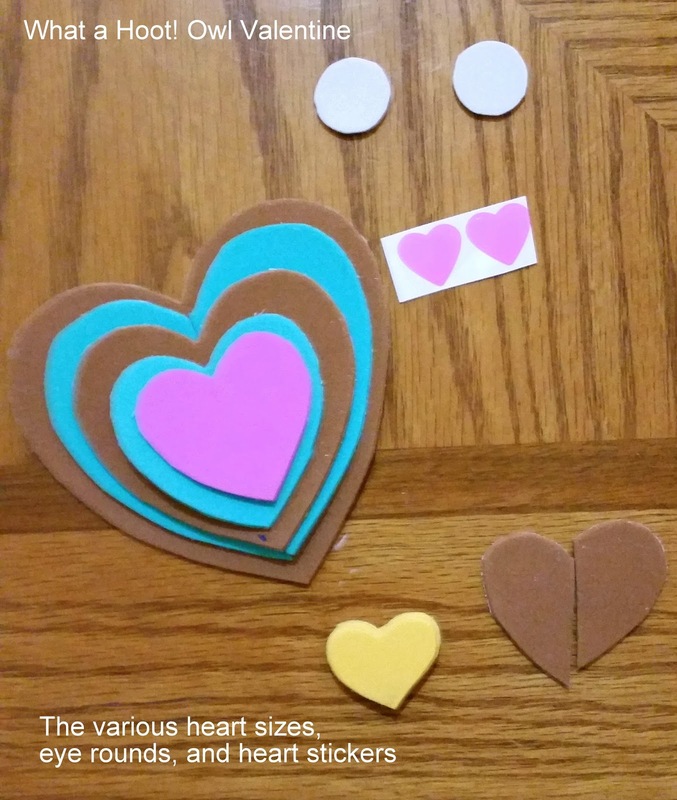 I'm good, but not THAT good where various sized hearts would not only be perfectly balanced but also the same variety of shape regardless of size. 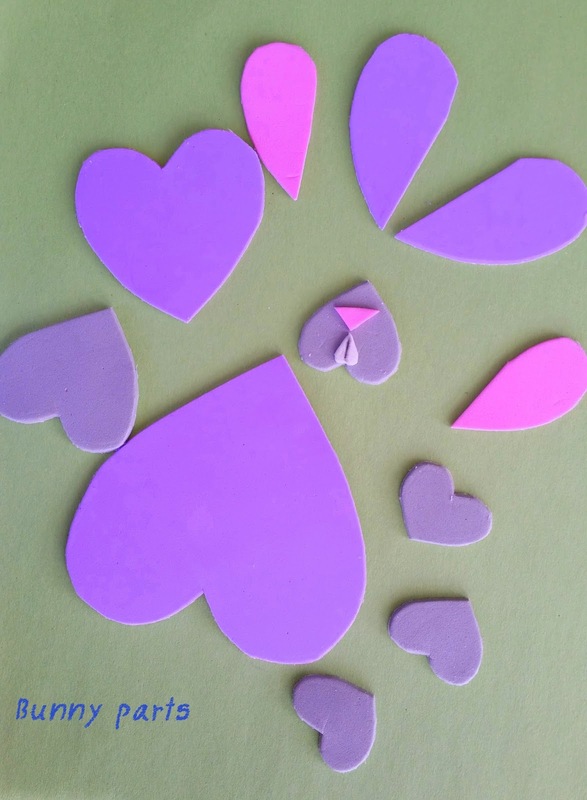 Ok, google me this..."heart templates"....and kid you not, heart templates abound in the image options! Woohoo! Or is it woohoot? Anyways, for a great pair of printable templates you will want to check out these two from activityvillage.co.uk. For the first one click here and for the other go here. Looking at the 1st template from "click here," the 1st large heart will act as your head heart, the heart next to that will be your tummy 2 heart, and the one next to that will be your tummy 1 heart. Moving down on the same template, the largest heart is your body heart and the one flipped upside down will be your wings heart. 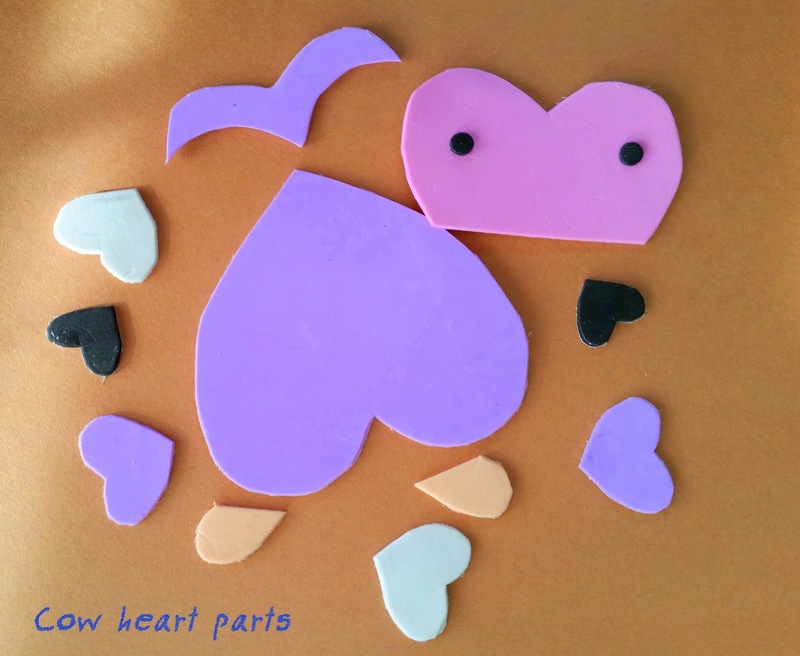 Now for the "go here" heart template, you will want to use the smallest heart for your nose and two feet hearts, and the second smallest one will be your ears heart. Medium wise for the owl, I went with sticky back foam paper. 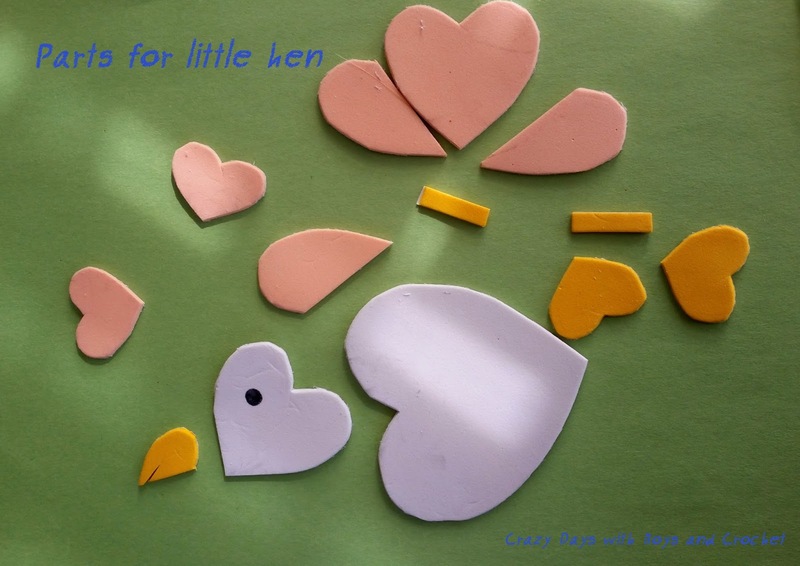 It's easier for kids to work with and helps to cut down on the amount of glue stick needs. Plus, it comes in some really fun colors! 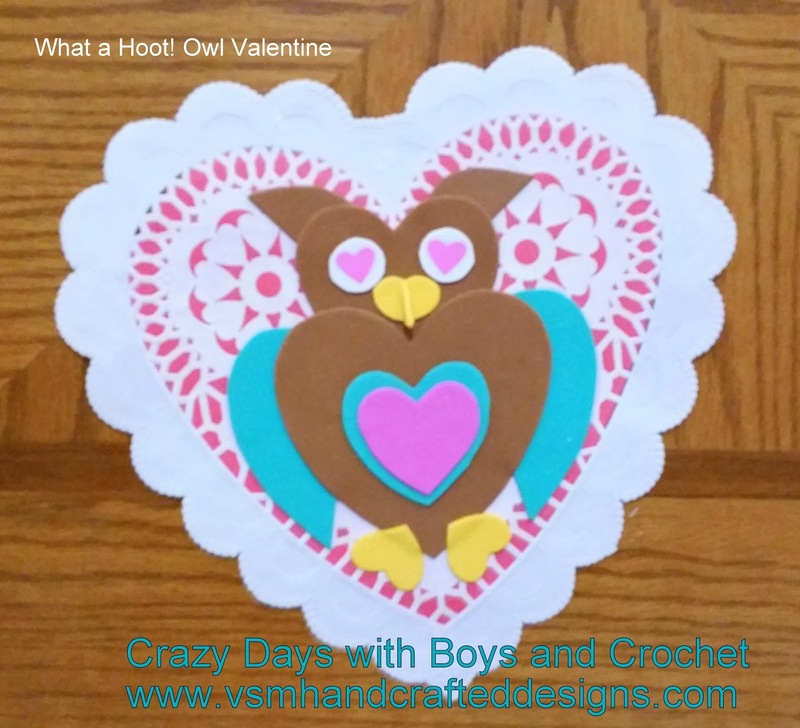 You're going to want to choose 4 colors and a sheet of white for all the parts of your owl. Color 1 needs to have 1 head heart, 1 body heart, 1 ear heart but split lengthwise (though the ear heart can be made from color 2 if you'd like). You will also need a small round object to trace for your eye whites, a paper lace doily of at least 10" or larger, red/pink construction paper, a glue stick, scissors, and small heart stickers for the pupils of the eyes, which is so much easier than trying to snip out itty-bitty hearts. 3. Get your body heart, your tummy 1 heart and your tummy 2 heart. 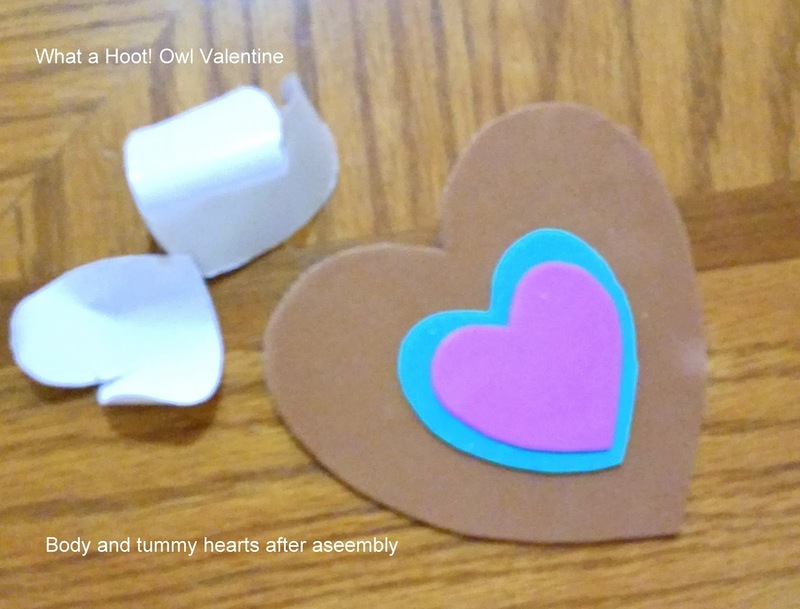 Remove the backing to tummy 1 and place onto the body heart. Remove the backing to tummy 2 and place on top of tummy 1 heart. 4. Now you will need your head heart, your two eye rounds and the two small heart stickers. 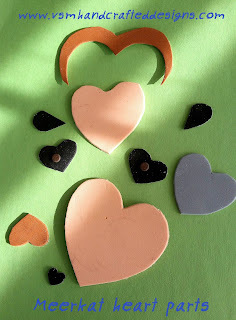 Remove the backing from the eye rounds and place the rounds at the top of the heart in the curve. 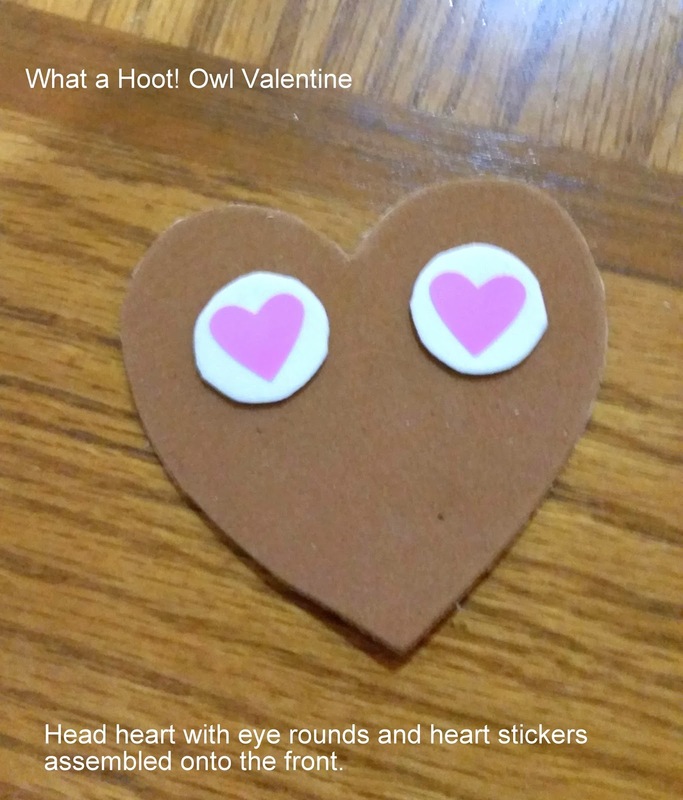 Then stick the small heart stickers on for the pupils. 5. 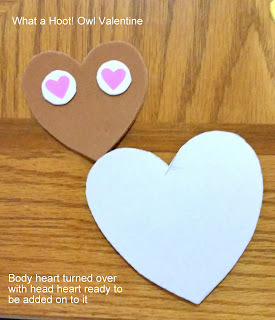 Get the body heart and turn it face down so you see the backing. Remove the backing to the body heart and then position the head heart onto the sticky back, keeping the arches about and putting the point of the head heart down a little bit onto the body heart. 6. 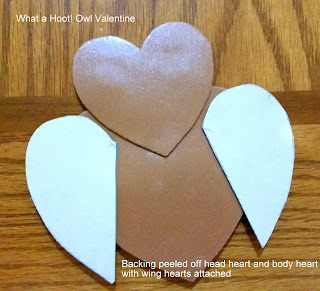 You now will need your wing heart pieces and the ear heart pieces. Remove the backing to your head heart at this point as well. First stick on your wings onto the body heart and then the ears onto the head, Make sure the wings have the curves facing out and the ears have the curves facing up and in to the center of the owl. 7. 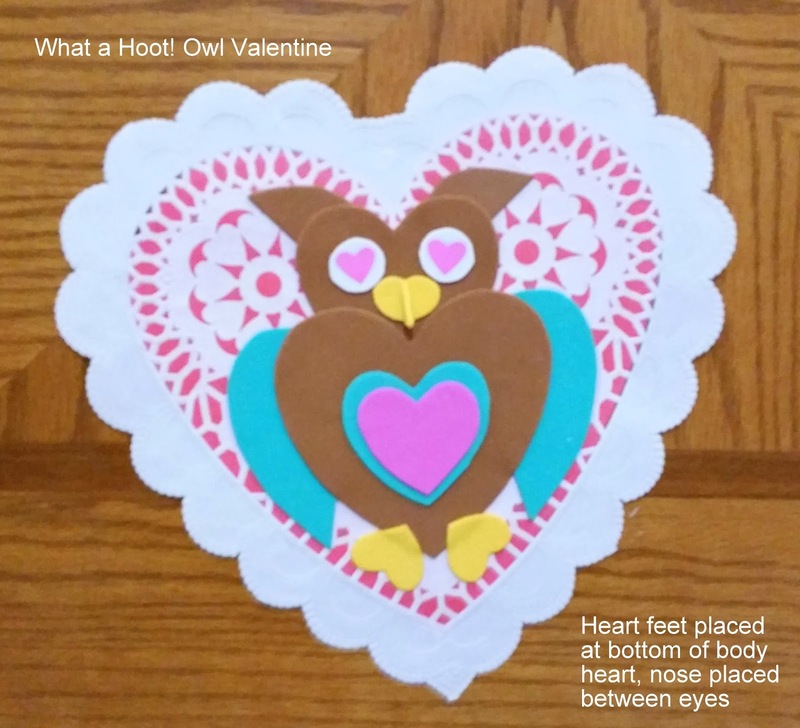 Now you will need to remove the backing to both the wings and the ears and then turn the owl to face right side up and place onto the front of the paper doily. 8. The feet and nose hearts will be added at this point. You can remove the baking to the nose and careful pinch the middle of the heart to make it more beak like. Or you can just leave as is and place between the two eyes. Then stick the feet on at the bottom of the body heart but have the hearts of the feet turned upside down. 9. Finally, turn the doily over and using a glue stick paste the message onto the back of the doily and fill out accordingly. And there you have it! A very cute, sweet, and lovingly made valentine!